Jack Brabham proved his win at Reims was no fluke when he followed with victory in the British Grand Prix at Brands Hatch, a result which opened up a sizeable lead for him in the drivers' championship. It was the first time a driver-owner led both the drivers' and constructors' standings. BRM had a frantic few days to get two cars on the grid. After Jackie Stewart's accident at Spa the team only had one vehicle left, and it had to recover an exhibition car from the Far East and adapt it for him. Ferrari was absent altogether and the reasons were confusing. The official line was a strike in Italy had made it impossible to travel, but rumours were rife that Enzo Ferrari thought it a waste of time to send his drivers to the acrobatic circuit as well as the prize money being insufficient. Purists were unamused by a few changes resulting from the demands of producers of the Grand Prix film who were shooting the race. Reg Parnell's Lotus was painted red, while Mike Spence's helmet was painted to look like the absent Mike Parkes'. Brabham was in control throughout the weekend, securing pole and then leading from start to finish. The English weather didn't help with a shower just before the start, so in the early stages Brabham was hounded by Jochen Rindt, who had switched to wet weather tyres. 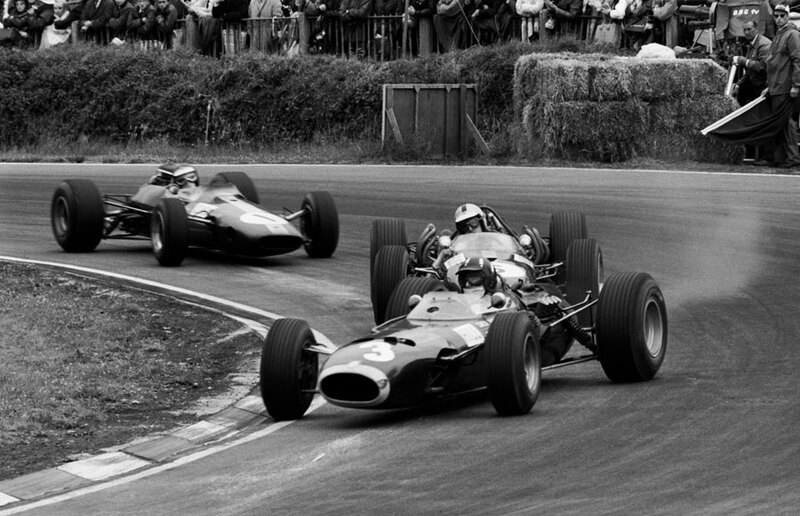 Graham Hill and John Surtees collided on the first lap, and while both sustained damage they were able to continue. Brabham, Motorsport reported, "was sliding the corners with beautiful precision and leaving everyone behind". As it dried out Brabham was out front on his own, with Surtees in second place. Hill and Jim Clark were in a battle for third place, both with two-litre engines but then the second Brabham of Denny Hulme, who had struggled at the start, came charging through. Surtees retired near the end with transmission failure leaving Hulme to complete the Brabham one-two. Hill took third place in his BRM, a superb comeback after he came close to a major crash during practice.